LAS VEGAS DAZE: Scientific Games Slot Company Tour Featuring Bally Technologies and WMS! Scientific Games Slot Company Tour Featuring Bally Technologies and WMS! If it's April then it's time for The Shamus of Slots to arrange a slot company tour for the Slot Fanatics Message board. Thanks Shamus! Big thanks to all the Scientific Games, Bally Technologies and WMS employees who were there to answer our questions! My friend Boots and I were given a ride to Bally Technologies where the slot tour was held by Bill (http://www.youtube.com/user/mcglaven555) and his brother Nick. We were almost the last to arrive because we accidentally took a walk through one of the other Bally Technologies buildings across the street before learning we were at the wrong building! After signing in and getting badges we entered a conference room where there was lots of food and drinks set up for our group. Scientific Games now owns both Bally Technologies and WMS slot companies and while it's my understanding they will keep their own branding there is now a certain amount of consolidation going on which resulted in us being able to meet with all of them together. We had a great question and answer period! During that session I mentioned getting stopped for recording at Palazzo by a slot attendant and the answer I got via my casino host when I asked him to find out the official policy for me from one of the Venetian/Palazzo slot operation managers on why recording was not allowed there, was that the slot companies don't allow it. This is not correct, both Bally Technologies and WMS said they love when the slot bonuses are recorded and talked about on youtube! Later Random$$slots made a suggestion to the companies that they publish a open letter by the game manufacturer's to the industry that players be allowed to record slot machines as long as no one is in the recording who hasn't given permission to be included, that table games aren't recorded and of course casino security features aren't caught on videos. So here's hoping that someone takes the lead on that in the future as currently there are only a handful of casinos who have entered the 21st century and are receptive to recording slot machine play and bonuses. After our question/answer period which ran a bit over the time scheduled for it, we took a break to play the new and not yet released slot machines. We broke into three groups and entered several rooms filled with slot machines. 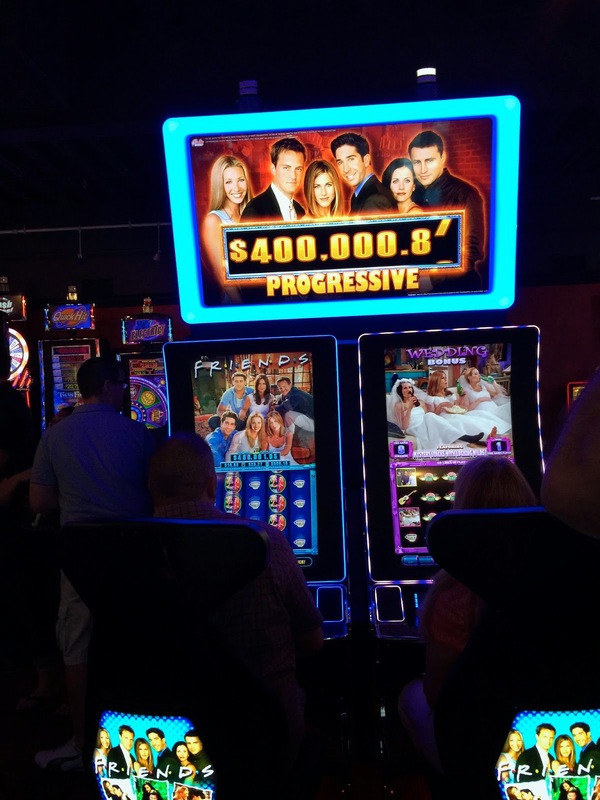 The new Friends slot was there but I got distracted with other things and forgot to play and record it. Darn! Some random photos of the various rooms with slots set up in them along with a few videos I took of slots that will be arriving on the casino floors in the future. Besides the main entrance there is a room full of WMS slots and then another one with Bally Technologies slot machines. The Flintstone Slot Machine series will be releasing a 3 Reel format soon! The main entrance now has a mixture of both Bally Technologies and WMS slot machines! TwinFire a new slot that combines both Quick Hit and Hot Shot! Demo of the Wizard of Oz, Not in Kansas Anymore Slot Machine! While some of us continued to play the new slots, others like myself broke off to get a tour of their Manufacturing area where they make and repair the slot machines. After the tour we joined back up in the conference room with the group who had stayed to play more demo slots. There were a couple drawings for prizes with the best prize being in my opinion the stained glass Monopoly theme lamp shade! The other prize was a solar backpack and I don't recall who won that item. This fabulous Monopoly lamp shade prize was won by Shamus's guest Johnny. Congrats Johnny! The lady below holding the shade is Jennifer, a Vice President of Lottery Insights with Scientific Games. At the end everyone got a great goody bag! Two shirts, one of them a nice Nike shirt that has Scientific Games on it, the 2nd a Monopoly T-shirt, two tote bags, a wonder woman wiping cloth that I forgot to put in the photo, a glass coffee mug, and Bally grip stand. Thanks again Scientific Games, Bally and WMS! Sounds like so much fun - thanks for the write up! Can't wait to try Twin Fire! Going to Vegas for the first time in 2 weeks...super stoked! Staying at the stratosphere. What are some things I should make sure I do and what should I avoid? I would appreciate the advice! Hope to see u at the slots, I'm a big fan! The area around the Stratosphere can be a bit shady so be careful and at night take a cab if you leave the stratosphere since it's not close to the main action of the strip and would likely not be a good walk to take. It's also starting to get hot in Vegas so if you are outside make sure to drink lots of water. If you are renting a car while in Vegas it will make it easier of course for you to get around. If you plan on gambling make sure to take out a player's loyalty card at each casino before gambling and use it if you are playing slots or video poker. It's not so important to use the players card for table games unless you are betting a certain amount per hand or bet. If you are on a strict budget check out Groupons and living social for Vegas deals you might be interested in doing. Also pack your own snacks, don't pay for snacks at gift shop prices. If you want to see some shows and don't care if you sit in the front rows then use tix4tonite or other discount ticket booths. Also check websites for show discounts (travelzoo, goldtar, smartervegas, etc.). This is a link to the vegas board on Trip Advisor that has a list of happy hours at Vegas locations for food/drink. Without knowing what you are looking for to do on your trip and a idea of budget, these are my suggestions. Hope they help! Thanks for the slot tour report Diana! I've never been on a slot company tour so this was really cool to read (felt like I was there). This place is like a slot fan's dream playground seeing all those new games and being able to try them out for fun! Glad you all got to ask them about their stance on slot video recording in the casinos. They got our backs! Thanks again! where can can i find a lampshade like that? is that the only one made ? I liked that lampshade too but not sure where to buy it. If you do a search on monopoly lampshade it might bring up some on ebay or someplace. Good luck, hope you find it!